These simplest form lenses have flat surface on one side and spherical surface on the other. They are made of CaF2. These simplest form lenses have flat surface on one side and spherical surface on the other. They are widely used in telescopes, microscopes, collimators, optical transceivers, magnifiers, condenser systems and eyepieces. 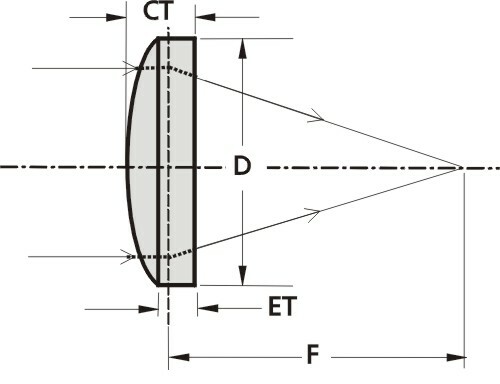 Lenses can be supplied coated. For required coating please refer to the COATINGS section. If you would like to order a coated lens, please note the code of the lens and the code of the coating in your request.